J.Crew’s Mickey Drexler Confesses: I Underestimated How Tech Would Upend Retail read the headline of a big feature in the Wall Street Journal, which ricocheted around the retail and technology world last week. The piece highlighted J.Crew’s struggles under Drexler’s leadership, which has resulted in ten consecutive quarters of falling sales. Yet the struggles of J.Crew, Gap, Ralph Lauren, Abercrombie & Fitch, American Apparel and many others go beyond the simple explanation that they missed the impact of technology or a specific trend. Instead, these merchandising-driven brands are caught in the middle of one of the most profound but little talked about shifts in the retail and apparel space: the shift from a supply-driven world to a demand-driven world, and the cultural change needed to thrive today. Retail existed for hundreds if not thousands of years before the internet transformed society. Back then, shopping was a local activity. A shopper could only buy products in her physical vicinity. If brands wanted to sell their products, they usually had to open up physical stores or enlist people to sell their products as door to door salesmen. The impact of retail was physically limited. Because of this localized reality, merchandising—the process of displaying, curating and organizing products in a manner that drives sales—was crucial. Buyers, who decided what and where products would sit on the sales floor, were critical to the success of a store and brand. As were designers and creative directors, who dreamed up the styles and designs each season. These teams held an immense amount of power, often relying on gut and sometimes historical data to inform their decisions. During this time, retail was a supply-driven world. Designers would design products and buyers would buy products that they thought shoppers will like. Six to twelve months later, these products would show up on the sales floor for the moment of truth. The feedback loop was slow, which would repeat every season. Design and merchandising reigned supreme. This often created a monologue between brands and shoppers, as the former would do most of the talking and shoppers were expected to listen. Sometimes there was a dialogue, but the brand’s response or acceptance of the shopper’s requests were often slow, if existent at all. Many called him the “merchant prince” because of his success building some of the biggest merchandising-driven apparel brands such as Old Navy, Banana Republic and Madewell, in addition to Gap and J.Crew. Drexler relied on his own research and instinct, which was once described as “relentless, idiosyncratic, and unstatistical; his sample group is whoever passes through his life or his in-box.” At Gap and J.Crew, Drexler centralized merchandising to an extreme. He was the merchant. Since merchandising made Mickey Drexler who he is, it makes perfect sense that he presumed it would continue to. Understandably, he held firm. At a conference in 2010, long after the shift away from a supply driven-world, Drexler said, “At the end of the day, I think the franchise lasts as long as the creative product gets flown through.” This mentality is all he knew, yet it would be his—and the industry’s—undoing. As internet adoption skyrocketed in the late 1990s and early 2000s, browsing and buying products moved from a local to a global activity. Shoppers were no longer bound by the limited selection of products in their town. They increasingly had access to millions of products around the world as the number of choices and competition grew exponentially. Then social media happened, further catalyzing the shift from a world of gatekeepers who governed supply to a world where shoppers increasingly wielded the powers of demand. The introduction of Instagram in 2010 might have been the final nail in the coffin, as the platform unleashed the most important discovery tool in fashion and apparel today. The retail store used to have a monopoly on discovery, but the internet and Instagram have relentlessly challenged the conventional wisdom. The industry used to think about a shopper as the ending. Today, a shopper is the beginning. The feedback loop that often took nine months to get a shopper’s opinion on a design collapsed to weeks, if not days or minutes. It’s as close to real time as it’s ever been. Thriving in this world required two related changes: 1) brands have to move more quickly; and 2) be more decentralized than ever before. Requiring the CEO of a company to sign off on most designs and orders is no longer acceptable, nor are products that take nine months to get from design to delivery. The increase in speed and decentralization are directly at odds with the supply-driven world that existed before the internet. Today, no single person can ensure the fate of a brand, and the quest to hold on to this long-gone reality is futile. Many brands such as Gap, J.Crew, Old Navy, Banana Republic and Ralph Lauren resisted these changes. While these actions seem nonsensical, they make perfect sense when one realizes that speed and decentralization are more cultural than operational. Changing culture is incredibly hard, which is why insurgents often have advantages over incumbents. This is exactly what happened. A new crop of “fast fashion” brands expanded rapidly, as they were able to build their culture around the demand-driven world of the present, not the supply driven world of the past. Zara and H&M, the two most well known brands, thrived as they cut lead times down to three weeks. They also gave what were traditionally extreme levels of control to lower level managers and merchants who were closest to the sales floor. They had daily calls with headquarters and were allowed to request products without the approval of higher ups. One sourcing executive described the difference: Zara is “afraid of not making a quick decision” while Gap is “more fearful of making the wrong decision.” Some brands responded while others either waited or denied the new realities of the market. Unlike rivals such as Gap, H&M, and Primark, Zara has no chief designer, and there’s little discernible hierarchy. Its 350 designers are given unparalleled independence in approving products and campaigns, shipping fresh styles to stores twice a week. Guided by daily data feeds showing what’s selling and what’s stalling, the teams develop fashions for the coming weeks. Every morning, staff in Arteixo decide what’s popular by monitoring sales figures and thousands of comments from customers, store managers, and country directors in cities as far-flung as Taipei, Moscow, and New York. We’re now seeing merchandising move from a differentiator to just another input. It’s no longer about talking, but listening. As a result, the profession is radically changing. A job based on gut is moving to one based on data, assuming the job exists at all. Take Combatant Gentlemen, a direct to consumer brand that sells men’s suiting and essentials. The company employs under a dozen engineers that built a technology stack that integrates the brand’s planning, design, marketing and commerce systems into an all-knowing brain. If a shopper adds a product to the cart and then removes it, the brand knows and feeds this info back into its demand planning system. If a shopper returns one size and keeps another, this informs how the brand will reorder that product, if it does at all. All of this happens automatically, and while there are still humans making some decisions, the brand has no merchandising team. Most of its buying and planning is entirely automated. The same goes for Amazon’s growing list of private label brands, which use the company’s unparalleled data to build demand-based brands that are nearly guaranteed to sell. Amazon only creates supply when there is demand, not the other way around. The results are promising as Amazon is about to become the largest apparel retailer in the U.S., and an increasing share of its haul will be from its private label brands. When industries are shifting, the reasoning lies not in the symptoms—certain brands struggling or trends evolving—but in the root causes—the shift from a supply-driven world to a demand-driven world. 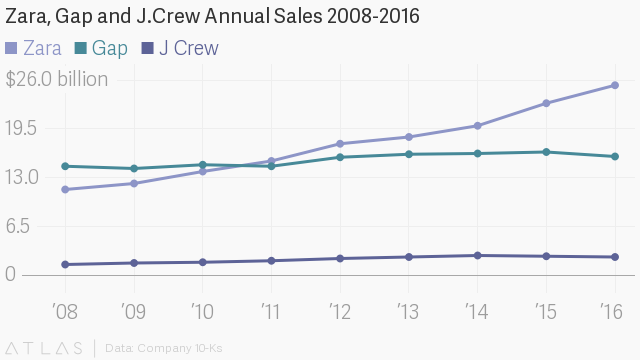 The decline of J.Crew and its ilk is not the result of any single leader, decision or trend. It’s because of a fundamental shift in the mechanics of commerce, arguably one of the most profound changes the industry has ever seen. But challenges for some are opportunities for others, and brands that are brutally aware of the shifting consumption landscape will continue to succeed. Those that aren’t conscious of the earth shifting below their feet will only solidify themselves as relics of the past.